At various times in the past, bananas have been grown on a commercial scale in Florida, although the plant is presently used primarily as an ornamental (Stambaugh 1951). One of the most serious insect pests of bananas is the banana root borer, Cosmopolites sordidus (Germar). Figure 1. Adult banana root borer, Cosmopolites sordidus (Germar). Photograph by G. McCormack, Cook Islands Biodiversity Database. This beetle has been transported throughout the banana growing regions of the world. Pierce (1918) had no sooner warned that it was likely to be introduced into Florida when it was discovered (Newell 1919). It was erroneously recorded as eradicated in Florida by Lyle (1947) and the Commonwealth Institute of Entomology (1968). Blackwelder (1947: 915) listed the following synonyms of Cosmopolites sordida (Germar): cribricollis Walker, mendica Olivier, and striata Fahr. Zimmerman (1968b) discussed another closely related species, Cosmopolites pruninosus Heller, as a pest of bananas in Micronesia. In some of the earlier literature Cosmopolites sordida was placed in the genus Sphenophorus. The banana root borer is known from nearly all banana-growing areas of the world. Corms or rhizomes are used for propagation and eggs and larvae are easily transported therein. In 1968, world distribution was mapped by the Commonwealth Institute of Entomology, listing southern Asia, Africa, many Pacific islands, Australia, northern South America, most of Central America and the West Indies. In North America, it is known only from Cotaxtla, Veracruz, Mexico and Florida and Hawaii (Mau and Kessing 1993). The first Florida infestation was found at Larkin (Dade County) in December 1917 and March 1918 in Manatee County "...this appearing to be the point where the insect had become established several years previously." (Newell 1921). If the species was eradicated it was soon reintroduced and has probably been present since 1920. Newell (1921) discussed the eradication program initiated after the first infestation was discovered and stated that "...no infestations...are known to occur in the state at present." Sleeper (1957) recorded it from Marco, Flamingo, Ft. Myers, Opa Locka, Miami, Larkin and Coconut Grove. The Florida State Collection of Arthropods contains the following additional records: Ormond, Palma Sola, Buckingham, Key West, Coral Gables, White City, Cutler and Homestead. The brief descriptions and illustrations given here are for general habitus. Technical descriptions of all stages are presented by Moznette (1920) and Anderson (1948). 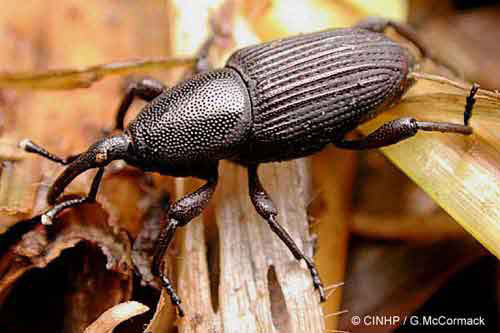 Adult: The adult weevil is dark brown to grey black, shining, about 11 mm long. It is similar in general appearance to the billbugs (Sphenophorus), but lacks the depressions on the pronotum. All tibiae are armed with hook-like extensions which enable the beetle to hold tightly to plant tissue. Figure 2. Dorsal view of an adult banana root borer, Cosmopolites sordidus (Germar). Illustration by FDACS - Division of Plant Industry. Figure 3. Frontal view of head and pronotum of an adult banana root borer, Cosmopolites sordidus (Germar). Photograph by Museum Victoria, Melbourne, Australia; www.ipmimages.org. Figure 4. 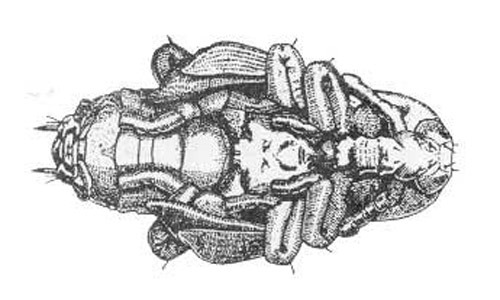 Lateral view of head and thorax of an adult banana root borer, Cosmopolites sordidus (Germar). Photograph by Museum Victoria, Melbourne, Australia; www.ipmimages.org. Figure 5. Lateral view of thorax and abdomen of an adult banana root borer, Cosmopolites sordidus (Germar). Photograph by Museum Victoria, Melbourne, Australia; www.ipmimages.org. Larva: The larva is typical of the weevil subfamily Calendrinae, the body white and the head capsule dark reddish brown. The last two abdominal segments are modified into a plate-like structure giving a "chopped off" appearance in lateral view. The eighth abdominal segment bears a large elongate spiracle, but all other abdominal spiracles are minute and indistinct. Figure 6. Larva of the banana root borer, Cosmopolites sordidus (Germar). Illustration by FDACS - Division of Plant Industry. Pupa: The pupa is also typical of the subfamily Calendrinae, the beak being very irregularly margined with numerous transverse depressions. Figure 7. 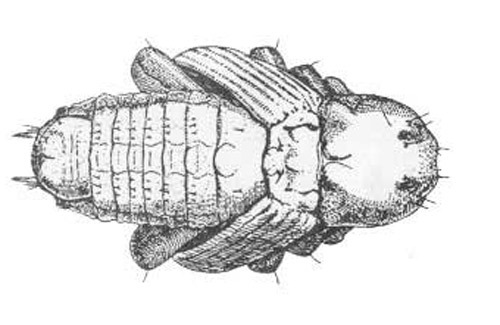 Ventral view of the pupa of the banana root borer, Cosmopolites sordidus (Germar). Illustration by FDACS - Division of Plant Industry. Figure 8. Dorsal view of the pupa of the banana root borer, Cosmopolites sordidus (Germar). Illustration by FDACS - Division of Plant Industry. Eggs are laid between leaf sheaths and stems as well as around the corm, often in the enlarged cell-like compartments in the tissue. They are usually deposited singly with the newly hatched larva boring into the corm. The complete life cycle is from 30 to 40 days; egg five to seven days; larva 15 to 20 days, pupa six to eight days. Figure 9. 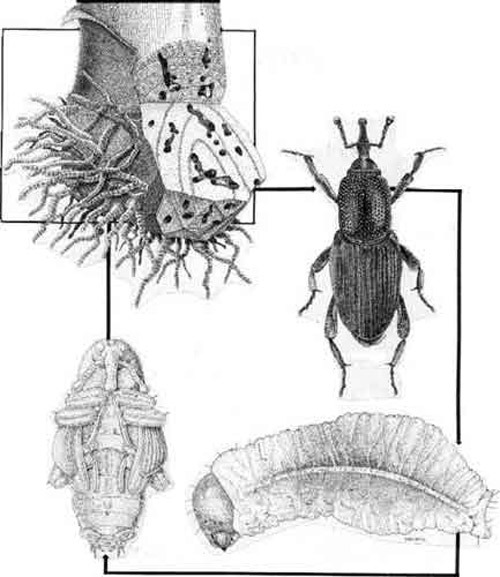 Life cycle of the banana root borer, Cosmopolites sordidus (Germar). Clockwise from top right, adult, larva, pupa, and tunnels in the banana corm. Illustration by Cook Islands Biodiversity Database. The adult can live for long periods without food and has been recorded to live for over two years. The adults are secretive in habits and more abundant at night. Although some authors have stated they are flightless, they have functional wings and have been observed occasionally in flight (Simmonds 1966). Traps can be made by placing sliced corms or cut sections of stem on the ground and collecting the weevils attracted to them. Most damage is done by the extensive tunneling of the larvae in the corm, thus weakening the plant and causing blow-down by even slight winds. Hord and Flippin (1956) tested the weevil as a possible vector of head rot in Honduras, but came to the conclusion that the banana root borer "...attacks rhizomes of banana independently of the head rot organism, and carries out its activities wherever possible on healthy tissue." Apparently all varieties of banana are attacked, although some preferences have been noted (Hord and Flippin 1956). It has also been found on Manila hemp, plantain, sugar cane and yam. It appears to be a very minor pest of the latter two, perhaps attacking them only when bananas are not readily available. Zimmerman (1968a) listed the hosts as Musa species with the note "...the records of attacks on sugarcane appear to be in error." Several predators (especially from Malaysia) have exercised some biological control and have been introduced into certain banana growing regions. The most successful of these is a histerid beetle, Plaesius javanus Erichson (Simmonds1966). Apparently none of these have been introduced into Florida. 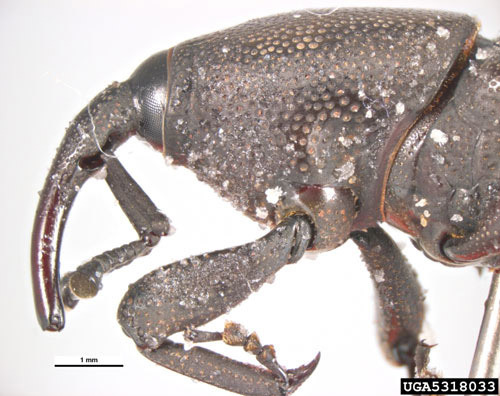 Mau and Kessing (1993) report that while a number of banana root borer predators are reported, and attempts at biological control using predatory beetles throughout the Pacific were made, they were mostly disappointing. Most predators are not specific to the banana root borer and the banana root borer larvae and pupae, located in tunnels within the plant, are protected from most predators. Mau and Kessing (1993) provide some suggestions for an integrated pest management program for both growers and homeowners that includes trapping and surveying, mechanical control and chemical control. However, these suggestions may not work or even be legal (i.e., chemical recommendations) in Florida due to the limited plantings of the banana plant in homeowner situations. Anderson WH. 1948. Larvae of some genera of Calendrinae and Stromboscerinae. Annuals of the Entomological Society of America 41: 413-437. Blackwelder RE. 1947. Checklist of the Coleopterous insects of Mexico, Central America, the West Indies and South America. Part 5. U.S. National Museum Bulletin 185: 915. Bullock RC, Evers E. 1962. Control of the banana root borer (Cosmopolites sordidus Germar) with granular insecticides. Tropical Agriculture 39: 109-113. Commonwealth Institute of Entomology. 1968. Distribution maps of pests. Series A, Map No. 41 (Revised), Cosmopolites sordidus (Germ.). Hord HHV, Flippin RS. 1956. 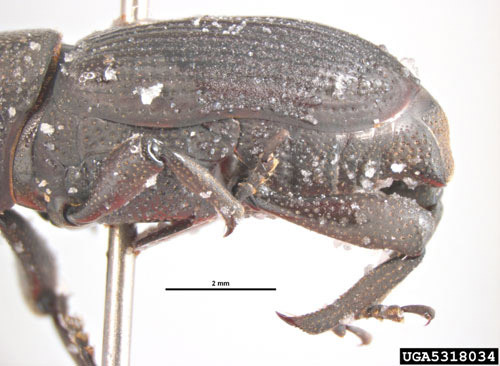 Studies of banana weevils in Honduras. Journal of Economic Entomology 49: 296-300. Leonard MD. 1931. A bibliography of the banana root weevil, Cosmopolites sordidus Germ. Journal of the Department of Agriculture, Puerto Rico 15: 147-176. Lyle C. 1947. Achievements and possibilities in pest eradication. Journal of Economic Entomology 40: 1-8. Moznette GF. 1920. Banana root borer. Journal of Agricultural Research 19: 39-46. Newell W. 1919. Banana root borer. State Plant Board. Florida Quarantine Bulletin 3: 71-73, 95-96. Newell W. 1921. Banana root borer. State Plant Board. Florida Quarantine Bulletin 5: 94-95. Peck SB, Thomas MC. (1998). Family Curculionidae. A Distributional Checklist of the Beetles (Coleoptera) of Florida. (no longer available online). Pierce WD. 1918. A manual of dangerous insects likely to be introduced in the United States through importations. USDA, Washington, D.C. 256 pp. Roberts FS. 1958. Insects affecting banana production in Central America. Proceedings of the 10th International Congress of Entomology 3: 411-415. Simmonds NW. 1966. Bananas. 2nd ed. Longman's, Green & Co., London. 512 pp. Sleeper EL. 1957. Notes on the Curculionoidea. 14. Ohio Journal of Science 57: 38-42. Stambaugh SU. 1951. Bananas in Florida. Florida Department of Agriculture. Tallahassee. 77 pp. Treverrow N, Bedding RA. 1990. Control of the banana weevil borer, Cosmopolites sordidus (Germar) with entomopathogenic nematodes. Proceedings and Abstracts of 5th International Colloquium on Invertebrate Pathology and Microbial Control, Adelaide, Australia. 233. Wolfenbarger DO. 1965. 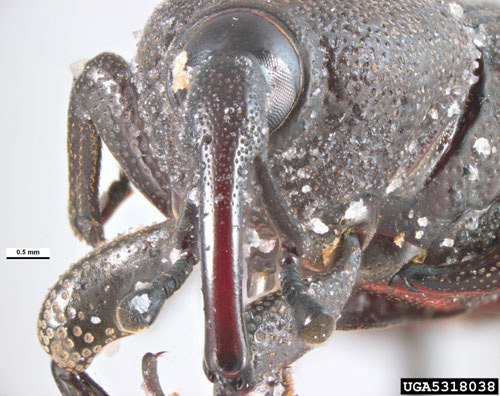 Banana root borer (Cosmopolites sordidus) and its control in Florida. American Society of Horticultural Science, Caribbean Region Proceedings, 12th Annual Meeting 8: 67-70. Zimmerman EC. 1968a. 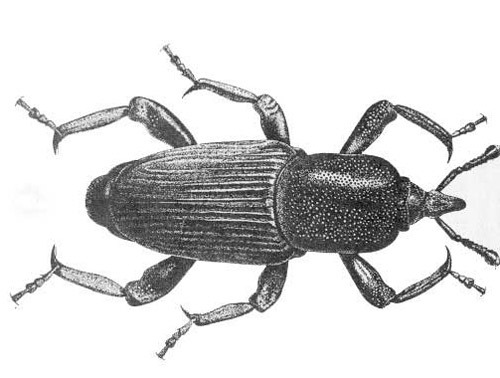 Rhynchophorinae of southeastern Polynesia (Coleoptera: Curculionidae). Pacific Insects 10: 47-77. Zimmerman EC. 1968b. Cosmopolites pruinosus, a new pest of banana. Journal of Economic Entomology 61: 870-871. Authors: Robert E. Woodruff (retired), Florida Department of Agriculture and Consumer Services, Division of Plant Industry; and Thomas R. Fasulo (retired), University of Florida. Originally published as DPI Entomology Circular 88. Updated for this publication. Publication Date: October 2006. Latest revision: August 2015. Reviewed October 2018.